National Girls' Chess Championships - Success. Discuss anything you like about women's chess at home and abroad. Re: National Girls' Chess Championships - Success. Geoff Chandler wrote: Let's see some of the games from the kids. paint the trees red to get their ideas across. Here's one my nine year old daughter played today at the Gigafinal. Not perfect by any means, but I was very impressed by her attacking prowess. At this level the attacker wins nine times out of ten. only playing over the game. because the blunder ratio is so high. One mistake defending is usually curtains. Now is a good time to start trading ideas. Advise if you see a good move. STOP! Never accept the first bid. Haggle with the position. Look for a better move. And it takes full advantage of the unprotected Knight on h5. 13...RxR 14.BxR+ picks off the h5-Knight. Piece up. 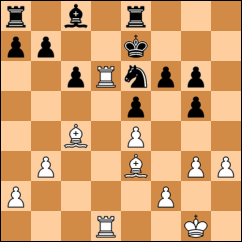 It's not a moot point because Black had a clammy defensive move. 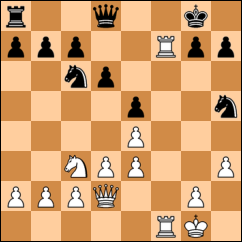 14...Nf6 and White has to play 15.Rfxf6 giving back the exchange. take either position. But given a choice I'd take the piece up. Let her decide which one she likes. Next lesson cover Discovered Checks. "The Dive Bomber of the Chessboard." (Ruben Fine). and Â½ a dozen easy combo's based on picking up loose pieces. Unprotected pieces/pawns are at the root of 90% of all non-mating combinations. Glad you enjoyed the game as well. No name of the loser was given - perhaps best that way. because the e-pawn is pinned to the undefended Queen. The player may have seen this when chopping the f3 Knight. You have got to see their ideas and plans, sometimes they are beautiful. TouchÃ©! I nearly fell out of my chair laughing there. 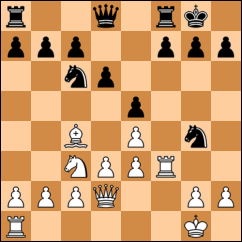 Good point about the possibilities after 10...Ng4 . Thanks for the analysis Geoff. We did go over the game immediately after it was finished (best time to go over a game with a junior, though it's often not possible) and spent some time looking at the merits of 13. Bxf7+ compared with 13. Rxf7. I must admit I completely missed the 13. Bxf7+ Rxf7 14. Rxf7 Nf6 line. Me: Is that knight cee six or knight eff six? between the Rooks in my murky past. You never forget wee tricks like that. way to learn the game is to play the game. Things stick when you play. I know what you mean about the ' look of disdain. game he had just lost when he played what seemed to me a very odd move. "Why did you play that?" I asked. "I see...But why did you play that?" Then came the look of disdain, "The computer...."
Obviously a member of the Stepford Chess Club. ...Hey Carl I'm dragging the thread back on track....do I get bonus points? ...and that can only be a good thing. I think I've discovered why I missed Nf6. Do you remember this position that I showed you a few years ago? Perhaps understandably I obviously have some sort of psychological block when it comes to this particular tactic. Thanks Sabrina. Chloe dodged a bullet in round 2 after achieving a completely lost position in eight moves, but having swindled that one she seemed to become invulnerable. In the last round the father of the girl she was playing said to Chloe "You know you've won the tournament even if you lose, don't you?". Luckily I was within earshot and when he left I leant over and told her that although she would get the trophy, she would have to share the prize money with four or five other girls if she lost that game. At the thought of losing all that dosh I saw the steely look of detemination cross her face again and that's when she played the game I posted above. Haha love it Great efforts! about playing in tournaments for no money. Get her logged on here so she can say no. and winning. I think this matters in pattern remembering. You need to get out more and lose more games. My loss was in the same bones of the position as Chloe's game. 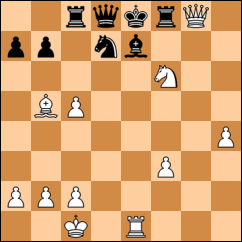 I nicked the f7 pawn with the forward Rook and suddenly this Knight from h5 moved backwards! to f6. I lost the exchange and the game. It's always the losses that stick. Richard Kynock's name came up yesterday because he walked into a trap in the King's Indian. and a few opening traps. (He walked into the same one twice!). All I can really remember are my three losses. A Sicilian where I sacced the exchange on c3 to nick the e4 pawn only to realise upon closer inspection I could not take it. A Blackmar where I was just out-played. The one glorious win is the famouse triple pin game. G.Chandler - R.Kynoch Edinburgh Club Champiohsip 1981. 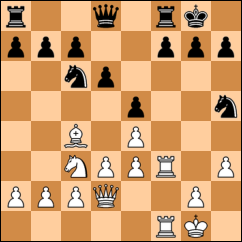 Three pieces can take the Knight on f6 and all three are pinned to the King. I bet none of the girls in the National Girls' Chess Championships pulled a mate like that out of the bag.